IT’S A funny thing this technology lark in motorcycles. All the top litre sports bikes are great machines, each and every one of them. They all have more power than most can use on the road, they are all incredibly fast, and their handling ability is better than the average punter can cope with anyway. But to be on top of the sales charts, each new model has to step it up in the technical aids game. Does the ZX-10R have the technical ability to compete at this top level? Yes. A bike with so many rider aids can only be at its best if the rider takes the time to explore all the aids in detail. Many probably won’t delve too much into it, finding a setting that suits them and leaving it at that. It seems funny that bikes will be bought on what they bring to the table without the owners looking all that hard at what is actually on the table. The 2016 Kawasaki ZX-10R is a good example of that. The bikes at the launch all came with the same suspension and rider settings, sorted by Bryan Staring, but it didn’t take long for people to change things to suit their own riding styles and beliefs. On the road you might never really even notice it but you can on the track that’s for sure. Matsuda San, the engineer in charge of this project told us his budget was used mainly on essentials needed for faster lap times, not for aesthetics, hence why the bike doesn’t look startlingly different. His aim was for the bike to be the fastest it could be on the track, not to be a fun machine where wheel stands and brutal acceleration are the norm. “If you want that,” he said, “buy a Ninja H2”. I finally realised a few hours later while charging on to the main straight at Wakefield Park what he was talking about. I ‘got it’. And that’s the reason why I think the new ZX-10R is the easiest to ride at speed sports bike I have ever ridden. It’s one thing to get a sensation of speed because the bike is frighteningly fast or loves to launch out of corners on the back wheel, but I cannot think of another bike which has allowed me to ride as comfortably fast as the 2016 ZX-10R. Plenty have been close, and arguably more fun, but the Kawasaki is King Lap Timer at the mo ment, for me at least. ‘Look at this’, is exactly what Kawasaki Australia’s team were telling us when pointing to the new Showa External Chamber forks. These type of forks are usually found only on super bike grids and are extremely expensive. Showa has obviously made a set a bit more obtainable price wise and they look the business, they really do. They are internally essentially the same as WSBK spec forks but with a smaller diameter, which should help give a bit more flex and ‘feel’ for the road. Another area the bike has been changed for the track is the lower seat height. This gives the rider more of a sitting in feel than a perched on top. Personally I’ve never liked race bikes that have the rear end jacked so high you feel like you are looking at the front wheel. It’s a personal thing I know, but the new riding position suited me. The offset though is the reduced distance between the seat and footpegs. Yes you sit more ‘in’ the bike but there’s less leg room than before. Shorter riders will prefer this I’m betting. We must remember the bike has been designed to be faster on the track and most racers are not six feet tall. There’s been a few chassis changes suiting the new track focused mantra. The previous generation ZX-10R needed a lot of height in the rear to get it to turn better. This was usually done by simply adding spacers under the rear shock, quite a few in fact, and many riders preferred their rear wheel to be as far back as possible to improve stability, usually brought on by the fact the rear end was so high. The 2016 model has the steering head now brought closer to the rider and it has a longer swing arm. Part of the race kit is an adjustable steering head and swing arm pivot for further chassis tuning ability, and the engine has been placed higher in the frame too, which is to help improve corner turn in by having a higher centre of gravity. It really is more a case of what hasn’t been updated rather than what has with the 2016 ZX-10R. The engine was never short of outright grunt and hasn’t been changed too much. Power is much the same as before, 200hp at the crank (207 with ram air effect), but there’s been improvements in cylinder head porting, exhaust valves, cams and the combustion chamber. It’s all about a better burn and exit of the gasses by the sound of it. It does have more power but doesn’t necessarily feel like it on the track. Other engine related improvements are electronic throttle valves, a lighter crankshaft, bigger airbox, cassette style gearbox and a titanium exhaust. Like I said, there’s a raft of updates but these are the ones which stood out for me. S-KTRC – This traction control system is way ahead of the previous generation system. It is linear in it’s action, by that I mean there are no real steps that you feel. There are five settings and the aim, according to Kawasaki literature, is to maximise acceleration rather than save you from a high side as such. I really noticed this on corner exit, with the bike seemingly unable to wheel stand out of the corner. Remember than ‘got it’ moment I mentioned earlier. That’s when it all made sense. The bike wouldn’t let you wheel stand because it wanted to get you to the next corner as quickly as possible, and pulling ‘wheelies’ isn’t the way to do that. There’s no wheelie control as such, just a very sophisticated traction control system. Bosch Inertial Measurement Unit (IMU) – This is the brain which controls the electronics by taking data from five different axis, angle, pitch, yaw, braking and acceleration. The IMU interacts with the traction control, the cornering management function and other electronic features of the bike to get you cranking around the circuit as fast as possible. Balance Free Front Forks – These WSBK derived Showa forks are sublime. Wakefield is a bumpy track but these forks soaked up everything thrown at it. Under braking or through very quick bumpy corners I could not fault them. Never once did I feel like changing the settings from what Bryan Staring delivered. Possibly the best stock forks I’ve ever sampled. Brembo brakes – These 50mm Monobloc calipers and 330mm discs also proved faultless. They are a great balance between initial strong stopping power and feel. The bike comes standard with race quality braided lines too, so no need to change anything for racing. Kawasaki Engine Brake Control – This was an area I played around with a bit. I shared the bike with Steve Martin and for the second session he changed to no engine braking. Of course there is still engine braking but it’s much less intrusive than standard. I didn’t know this had been done and in my second session I couldn’t put my finger on what had changed, but I wasn’t as comfortable at pace. Once I found out what had been changed I reverted to the standard engine braking settings and preferred it like that. Many racers will probably like the bike with as little engine braking as possible, to allow faster corner entry but it wasn’t for me. I do like the fact it’s available though. Power Modes – There are three, Full, Middle and Low. Middle is 80 per cent and Low is 60 per cent of full power. The power didn’t feel as strong as the previous model ZX-10R but it is stronger on paper. But the two factors which would affect this is we were on a tight track where outright speed couldn’t be exploited and the gearing is standard. Realistically the standard gearing would be lowered substantially if the bike was raced on this track. And the traction control getting involved in the mix too would have given me a slightly different perception of speed. Remember that Fun V Lap Time I was talking about? It is still wickedly fast though. There are quite a few updates besides the ones just mentioned, like the electronic steering damper, titanium exhaust, ‘high vis’ instruments and the quickshifter and KIBS (Kawasaki Intelligent anti-lock Brake System. Both ABS and Non-Abs versions will be available, with the ABS version retailing for $23,000 and the Non-Abd version for $22,000. A Limited Edition (Winter Edition) model will also be available, with some styling tweaks, for $23,200. The thing that really stands out for me with this bike is how easy it is to ride fast. The engine spins up very fast and the brakes are extremely potent, but the bike always felt planted under hard acceleration, hard braking and through very fast corners. I’ve ridden plenty of other superbikes around Wakefield Park Raceway and in certain spots of the track have struggled to keep my composure on the bike, usually under hard braking. Not so with the new ZX-10R, the bike felt so easy to control and get into the corner under hard braking, which had the added benefit of pretty much no arm pump. Initially I thought the bike understeered and at first thought it was me not trusting the bike on turn in. We increased the compression damping on slightly and it made a difference, but it was most likely helped by me having more confidence in the front end as well. 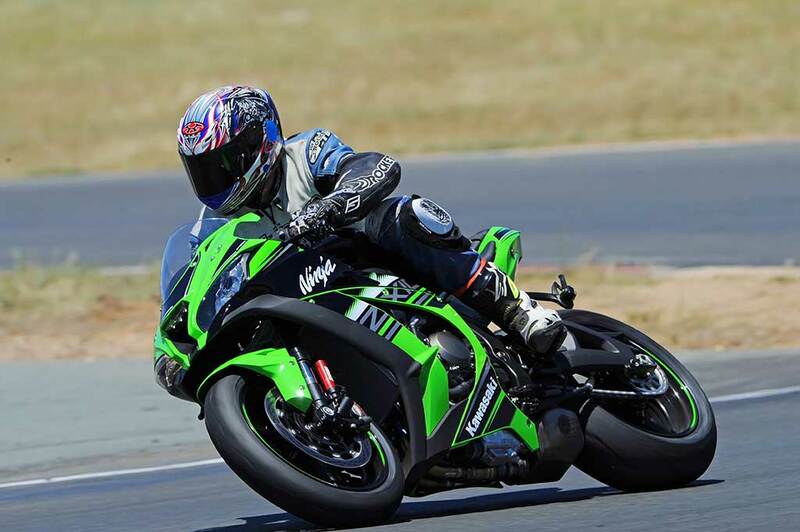 I don’t believe I have ever ridden a bike as fast around Wakefield Park as easy as I did the ZX-10R. No doubt many of the features of Johnny Rea’s 2015 world championship winning ZX-10R have made their way onto the 2016 customer machine. It will be interesting to see how it compares with the other hot shots on the race track here in Australia in 2016. It’s a bike which has plenty of technology on it but it doesn’t overwhelm you like some bikes can and is very intuitive in the way it interacts with the rider. It’s one of the best at doing it in fact.